Rand Fishkin has risen to become one of the most sought-after experts in the field of search engine optimization, his career paralleling the surging popularity and profitability of the company his mother and he founded. Rand has produced impressive content at moz.com and publicly speaks on advanced inbound marketing subjects, delivering strategic advice for non-technical business owners, as well as gritty, in-the-weeds technical nuggets for SEO professionals. This post compiles some of the latter: Rand’s technical advice, especially as to the future direction of SEO and online marketing in general. While SEO remains one of the fastest-changing industries, bedrock principles have stayed the same. Focusing on intriguing, unique content that attracts potential customers has been and will always be the best method of inbound marketing. That said, what has changed and what’s to be done about it? Google is moving away from exact matches between search terms and website content, to look more at the contextual meaning of the webpage. The hotshots down at Mountain View are trying to read the minds of searchers, and are surprisingly successful at it, by using topic association, topic modeling and entity matching. Domain-level keyword connections are on the rise. Google’s algorithm used to be very page-level biased – if the site did not have a page perfectly targeted at the searcher’s query, it ranked lower. Now Google is elevating known brands’ sites, even when individual pages may not be matched to the search. Lesson for SEOs: Invest in a domain level content strategy. Without a well-known brand, businesses are susceptible to being penalized by Google. Google’s crackdown on spam is essentially a penalty on unknown brands that rank well. Only big brands can get away with trying to manipulate Google. Google doesn’t want to look bad by not having a big brand in their results. Just look at the big brands that have been penalized and been back in the SERPs days or weeks later. Negative SEO is suddenly a serious concern. Negative SEO is a topic that organizations need to take seriously. The danger is real and the avenues of attack varied. For more, see this lengthy post. Google is shortening searchers paths, removing shallow content sites. Google is starting to replace many sites that have short “give me the answer” content. This happens by Google simply showing the answers within it’s SERP, above the sites with the information. Example: “NFL Schedules“, “Hubspot Founders“, “What does R rating mean“. In each instance, a website loses traffic (and potential revenue) to Google. Lessons for SEOs: If your site has this sort of shallow, easily-replaced content, beware! One website owner admitted structuring his large, high-traffic site to make it harder for Google to scrape this sort of content. At a minimum, manually monitor some representative, high-traffic keyword searches, as there is no tool currently available to alert a site owner to loss of traffic due to this sort of SERP reconfiguration. 87% “not provided” organic keywords is a well-known problem, however the remaining 13% can be very useful on high-traffic sites. Google Analytics sampling is more pervasive than apparent. Another argument for GA Premium. 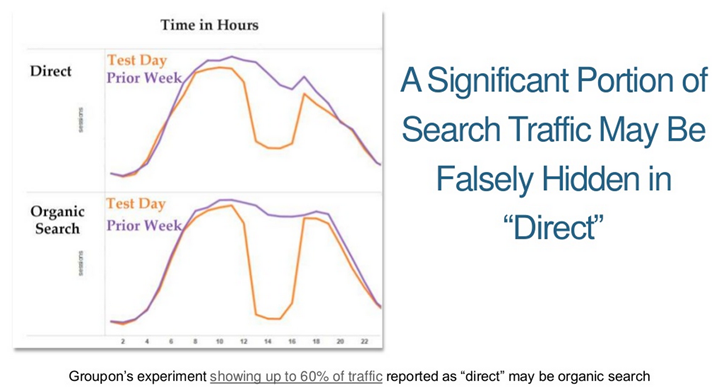 A further concern is the amount of “Dark Traffic” – Organic traffic misleadingly categorized as “direct”. Rand predicts this problem will only get worse, as Google closes off many avenues of analytics data. Lessons for SEOs: There are ways to measure “the unmeasureable”. Best to learn more sooner than later. Rand suggests a more robust process, incorporating more than just the ubiquitous AdWords Tool, Auto Suggest and customer data. Start with search, news, images, YouTube, Buzzsumo. Prepare to create fresh content repeatedly targeting the same keywords, and to consolidate old, poorly-ranking pages. For tools, he recommends keywordtool.io. Apparently, content is important, and links should be earned by building relationships instead of artificially acquired. You heard it here first, folks. Rand suggests targeting Resource page mentions, purchasing exposure (not actual links), investing in one’s brand and regular PR. GoConspire can find anyone at a given company and/or any specific person and how connected. Try targeting those influencers not at top of the heap – more likely to reply. Correlation exists between advertisers on small-medium sites & links. There’s a strong probability that at some point, the blogger/site owner will editorially link to these folks, simply because they’re top of mind. Brand mentions near keywords may have link-like effects. Still only general correlation to ranking improvements. Exception is Google Plus, for people within one’s G+ Circles. So, mainly relevant for influencers with large networks. Businesses need to recalibrate away from spewing untargeted content, to only creating content targeted at business objectives and at likely amplifiers, with significant resources allocated to promote content post-publish. Can’t be “Fire and Forget” – Post-publish outreach is key. Limited resources should be devoted towards content that already ranks and converts, rather than masses that are low-visibility. Rand recommends the new content creation tool Buzzsumo. Rand recommends tracking by website page, rather than individual keyword. Enterprise-level tools such as Conductor, Searchmetrics or Moz Analytics can guestimate the keywords sending traffic to pages. Rand points out that most firms are still using the default last-touch method. He is a fan of multi-touch attribution. Solution: Increase the vectors of exposure to potentially powerful events. Overinvest in your unique strengths. You are now officially prepared for SEO in 2015. Comment below or Rand will predict Baidu buys Google in 2016. Rand’s presentation slides are open to the public but only Moz Pro Subscribers can view the full webinar online. For more predictions from The Wizard of Moz, check his predictions from 2014 (conveniently graded as to accuracy) as well as current predictions for 2015.